The roof pitch calculator calculates slope, pitch, angle and rafter lengths, based on input of rise (M) and run (R). Use the diagrams on this page as a reference when inputting rise and run, and while interpreting the calculated results. To determine the finished height of the ridge beam, add the Rise (M) and the Y height. 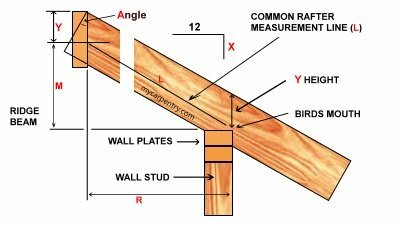 To determine the Y height, measure from the bird's mouth up the calculated slope (X in 12) to the top of the rafter. The top of the ridge beam = M + Y.
Slope - The slope of a roof is represented as X/12, where X is the number of inches in rise for every 12 inches of run. This is very useful information for many purposes, especially for roof framing - the slope, sometimes called pitch, is calibrated on speed squares. Angle - The angle of a roof is the same as the roof's slope, except instead of being represented as X/12, it is represented in degrees. This is useful because sometime you may need to cut a bevel with your circular saw that is not calibrated using roof pitch style - this setting on circular saws is calibrated in degrees. Rafter Length - The rafter length results, from this calculator, represents the length of line L on the diagram(s). Note that this is not the actual length of the rafter. It is the length of this portion of the rafter. If you plan to have overhang, etc. the rafter member will be longer. Pitch - Is the incline of the roof represented as the ratio of rise to the span (twice the run). For example, if the roof rises 4 feet and the span is 16 feet (twice the run), then the pitch is 4/16, or 1/4. If you are calculating rafter length from the center of the ridge beam (as shown below), you will need to subtract half of the thickness of the ridge beam from the top end of the rafter. For example, if the ridge beam is 1.5 inches thick, subtract 3/4 of an inch from the overall rafter length. For more information on roof building, cutting rafters and other design considerations, see the mycarpentry roof framing section.